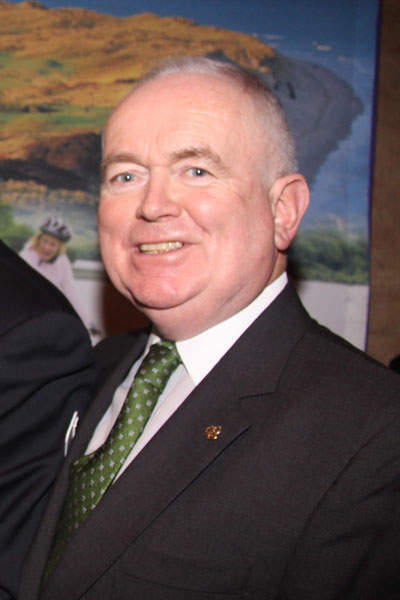 Long serving Tourism Ireland chief Joe Byrne never misses a chance to bring more visitors to his country. So on the eve of St. Patrick’s Day, Byrne took time out of his official duties to chat with Elite Traveler Editor-in-Chief Douglas Gollan about Ireland’s strong tourism trade and specifically why the country offers so much for the private jet lifestyle. Joe Byrne: Ireland kept promoting even during the downturn, and the fact is that has made a difference. Our downturn wasn’t as steep as some other countries and our recovery has been much faster. We have gained share from the U.S., and if things continue, 2012 will be our best year ever. ET: Is it helpful that Ireland’s Prime Minister Edna Kenny is a former Minister of Tourism? Joe Byrne: He’s passionate and he lives the brand. As a former Minister of Tourism he is focused on tourism and he really wants to talk about tourism because for him, he is truly excited about tourism. That is helpful for the entire organization, and we are happy that he is so committed. For example, he came to New York for the launch of our new campaign, and when the Prime Minister comes that generates extra attention and publicity. ET: What sets Ireland apart? Joe Byrne: Ireland allows people to be themselves. Anybody who comes to Ireland will have more fun in Ireland than anywhere else. We have a great brand and we deliver a great experience. The product over-delivers so no matter whether you are an elite traveler or on a budget, you get value and you tell other people about what a great time you had and how much fun it was. Ireland is a concoction of the people and places that come together to give you fun. ET: Do you consider golf one of the major attractions? Joe Byrne: Because we are modest people, I can say we are the world leader in golf. Thirty-three percent of all links courses are in Ireland. If you ask a golfer for the 10 must-play courses in Ireland, they wouldn’t be able to stop at 10. They are going to list Royal County Down, Royal Portrush, Ballybunion, Portmarnock, Lahinch, Waterville, Doonbeg, Adare Manor, Druid’s Castle, K Club, Mount Julliet. I think I am at 11 and I have about a dozen more to go! ET: What are some of the other activities that attract elite travelers? Joe Byrne: Horseback riding and salmon fishing are very popular. We have great rivers for fly-fishing. We are particularly known for salmon and wild trout fishing. It’s not uncommon to catch trout over 10 pounds. There are rivers in pretty much every area of the country that offer great fishing. Joe Byrne: Ireland is dotted with castles. In County Clare alone there are 365 castles. Some of these are private homes but they are open for group takeovers for weddings and birthday parties, and in some cases you are hosted personally by the lord and lady of the manner and you have at your disposal their personal staff. There are also of course castles that are now luxury hotels such as Ashford Castle and Adare Manor. Then there are of course luxury hotel groups that have come on the scene such as Four Seasons Dublin, The Ritz-Carlton Powerscourt and Conrad Dublin plus many independent wonderful five-star hotels. ET: What about meetings and conferences? Joe Byrne: The hotels and castles are great venues, but the big news is The Convention Centre Dublin opened last year. It’s the world’s first carbon neutral convention center and represents Ireland’s largest ever pour of concrete, low-carbon concrete. It was designed by Irish-born architect Kevin Roche who is a Pritzker Award winner, and the building’s unique structure and glass-fronted atrium with views of the River Liffey have made it a landmark right away! It is modern and state-of-the-art. While for elite travelers with their private jets we have over a dozen airports, if they have a meeting or celebration or are being joined by friends or colleagues who fly commercially we also have excellent air service, making Ireland extremely accessible. Joe Byrne: First of all, we have all the international luxury labels, but we also have some great Irish made luxury products such as Waterford crystal and Donegal tweeds. We also have some great Irish born fashion designers such as Philip Treacy (who has worked for Alexander McQueen, Chanel, Ralph Lauren and Donna Karan) who designed Princess Beatrice’s hat at the wedding of Prince William and Kate Middleton. Lainey Keogh is known for her knitwear and John Rocha is world famous. Then of course there is antiquing. In one square mile in Dublin you have over 30 galleries, and it’s the same in Belfast and many small towns have amazing antique stores. ET: What do you find visitors most surprised about? Joe Byrne: People used to say Irish cuisine was an oxymoron, but that just isn’t true anymore. Patrick Guilbaud was the first to win two Michelin stars back in 1996 and now we have Michelin star restaurants literally dotted across the country so not only Dublin and Belfast, buy in smaller villages as well. Ireland has the best fresh produce and fish so we start with the best ingredients, and today it is really fascinating to spend a culinary vacation in Ireland.